BUY THE BOOK from Wipf & Stock! Alive and Writing: What Recent Memoirs Reveal about Illness and the State of Health Care by Anna Leahy in Entropy "...Or Marjorie Maddox’s father, who, as she recounts in the reissued poetry collection Transplant, Transport, Transubstantiation, receives a heart transplant from a dead stranger: “'His heart is buried / in my father, / who is buried'....These books—Everything Happens for a Reason; Sick; The Family Gene; I Am, I Am, I Am; and Transplant, Transport, Transubstantiation—are each worth reading on their own, for the distinctive story of illness, for the sharp perspective, and for the original voice. If you’ve seen one, you’ve not seen them all. Each is a really good book in its own right. Together, they are an imperative, a call for compassion for each other. 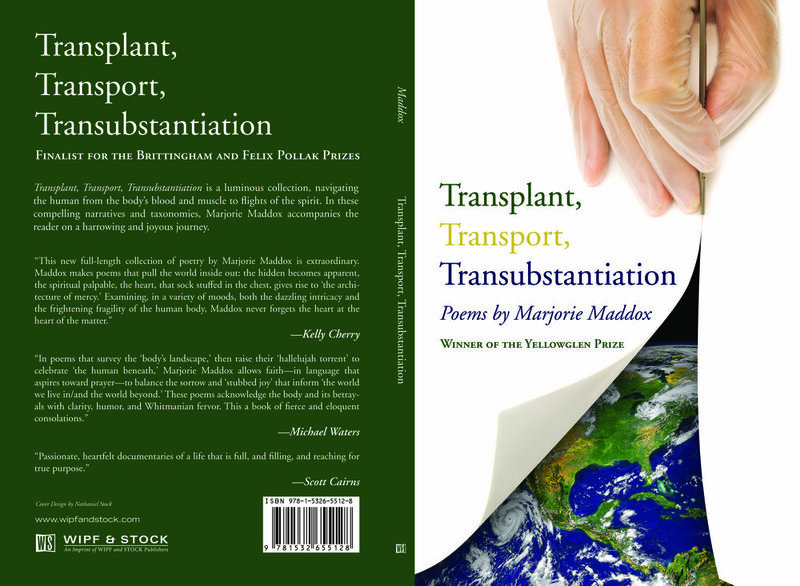 Moreover, they are a call for wide access to personalized health care and individualized decision-making between healthcare providers and patients...."
Reviewed at Tweetspeak Poetry by Glynn Young "...Transplant, Transport, Transubstantiation is about change both sudden and gradual. It is about what binds us in relationships, and what happens when those binds come undone or are severed. And it’s about reliance, what we have and what we find to help us go on." Interviewed about Transplant, Transport, Transubstantiation by Will Woolfitt at Speaking of Marvels "Writing is a process of discovering the world inside and around us..."
Reviewed by Lynn Levin in Poetry Niederngasse alongside Deborah Fries' Various Modes of Departure "... Marjorie Maddox’s rapturous collection Transplant, Transport, Transubstantiation is the winner of the Yellowglen Prize....A close and expert observer of nature, Marjorie Maddox is—as her book titles often denote—both a poet of the earthly and the transcendent. 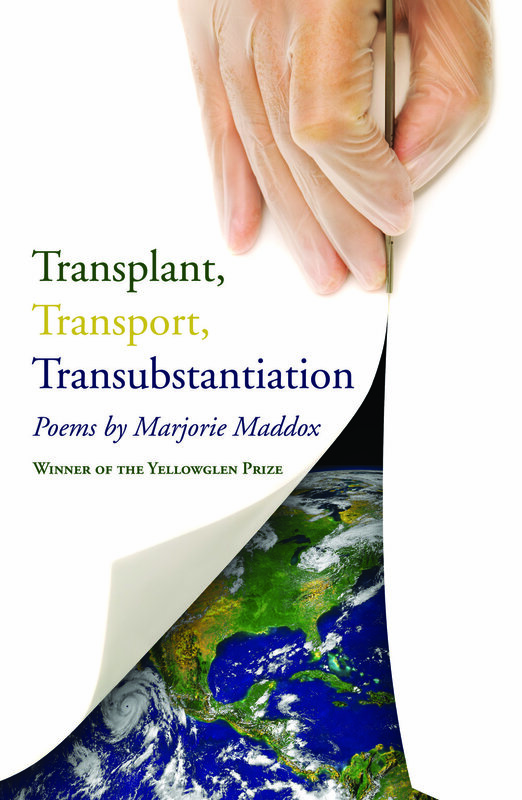 Her descriptions of medical and biological phenomena—surgery, the organs of the human body, a courier on an airplane carrying organs for transplantation—are often lenses through which she glimpses the eternal...."
December 2, 2018 article in the Williamsport Sun Gazette, “Local Poet, Author, Marjorie Maddox: “Much of my writing focuses on the intersection of body and spirit; on place; and on personal, historical or current events. In short, I write because writing leads to discovery by bringing us face-to-face with ourselves, but also with others and with the world. It is a way to enjoy, endure, and sometimes better understand where we have been, where we are going, and whom we are meeting on the way,” Maddox said.